To respect another by learning their language and culture allows us to transcend differences and connect confidently and honestly from the heart. Ground-based Liberty Practice allows us to enter the horse’s world; to honor their ways and to shift our perspectives. When we communicate with our horse as one herd mate to another, we open the door to a profound and joyful collaboration, built on mutual trust and confidence. Engaging in a dance with our horse, we notice a powerful rhythm start to flow, infusing all elements of our partnership with energy, intuition and grace. 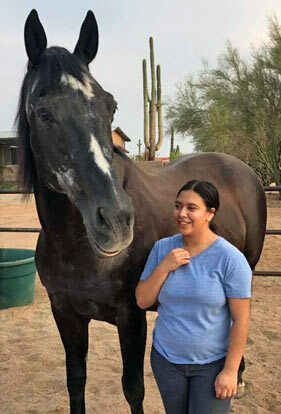 Becoming more horse-like can have a profound impact on all aspects of your life, deepening relationships and improving your mental and emotional equilibrium. Simply being in the presence of a horse is powerfully grounding and healing. Entering their world through Liberty Practice amplifies the effect, transforming every aspect of how you move through the world. By learning to be fully present, in touch with your highest inner wisdom, and consciously connected to the world around you, you can experience the horse’s natural state of mindful serenity. By giving the horse the freedom to choose, you can lean into a more natural leadership model based on sensitivity and deep listening. By embracing playfulness in work and the productivity in play, you can engage joy and expand your capacity for creativity. Bringing Liberty Practices into your daily routine can restore a sense of peace to your life while strengthening the bond between you and your horse. Liberty Practice can stand alone as a personal development or spiritual growth practice, or can be incorporated into your equestrian life, both on the ground and in the saddle. Want to learn more? Contact me to schedule your personal Liberty Practice session and experience life the horse’s way. I came to Liberty Practice when my relationship with my dream horse PB felt broken. I needed a way to rebuild our trust and forge a leadership based on mutual respect. His paddock became the conference table for some intense negotiations. Our language was movement, energy, emotion and intent. In the expansiveness of this space, we learned to soften and open our hearts to one another. Our Practice now is about joy, authenticity and connection. It’s our fitness program and our play time. Liberty Practice begins with learning to do less and be more with horses. Just being with horses is good for your heart and soul. It does wonders for your relationship with them. Here in this video, we show what can arise from spending time with horses just being. Interested in the other programs I offer? Learn about Gestalt Riding™ and Equine Gestalt Coaching™ .